Habitat: Riparian. This water-loving wildflower grows in and along streams in the desert, uplands, and mountains. Description: The flowers are clustered in axillary racemes. 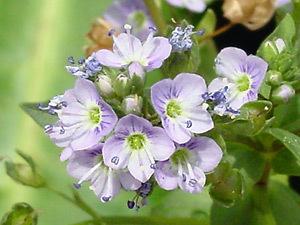 The individual flowers are 1/4 inch (6 mm) wide and have 4 purple-streaked lobes with white at the base, 2 stamens, and 1 stigma. The leaves mostly clasp the stems and are bright green, hairless, toothed or not, elliptic to ovate in shape, and mostly sessile. Some of the lower leaves may have short petioles (leaf stalks) and are non-clasping. 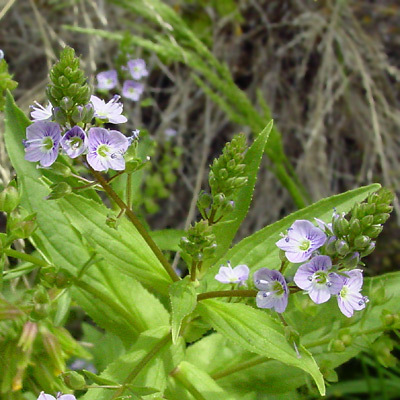 The similar American Speedwell (Veronica americana) has leaves with short petioles, while Corn Speedwell (Veronica arvensis) has hairy leaves. Edible – The leaves are edible either raw or cooked.